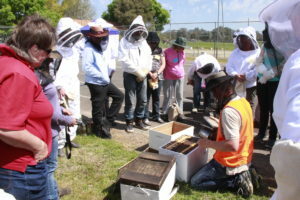 An annual event designed to bring commercial beekeepers and land managers from various government departments and other organisations to build networks and common understanding of issues relevant to the keeping of bees on public land in north east Victoria. Usually held in April in a commercial apiary , this afternoon event is designed to help newer beekeepers understand what they need to do to prepare their colonies for winter. Locally and seasonally specific advice can be given for the conditions experienced in North Eastern Victoria. Occasional informal evening events may be held throughout the year as opportunities arise. To ensure you stay informed of any events the NEAA may convene, you can sign up to our email list here. Alternatively you can check our calendar on this page that will be updated as events are planned.